Blogging requires a lot of time and effort. If you have a career, a spouse, two dogs, and great friends and you squeeze a food blog into the mix, you’re in for some busy evenings and weekends. Recipe development, testing, cooking, food styling, staging, photographing, and writing are all separate disciplines and each requires skill, time, and patience. From start to to finish a post can take many hours. Don’t get me wrong; this blog has been one of the most exciting things I’ve taken on in years. I truly am following my passion. Keeping all the balls in the air can be a challenge, though. I thank my lucky stars for a supportive partner! Sometimes my struggle springs from the balance between developing my own recipes and attempting recipes from the myriad cookbooks and magazines that clutter my kitchen. I’m always reading cooking publications and I discover recipes every day that compete for my attention. With limited time this week, I opted for a recipe from one of my favorite grilling cookbooks. I’m an enthusiastic Weber gas grill owner. The company has published a cookbook called Weber’s New Real Grilling and no less than 10 recipes from this cookbook top my to do list. The combination of pistachios and tarragon in this recipe piqued my curiousity and the finished kabobs did not disappoint. I’m a big fan of dishes that are quick enough for a weeknight meal and interesting enough to serve to dinner guests. This one definitely falls into that category. 1. Combine parsley, tarragon, pistachios, lemon juice, garlic, salt, and pepper in the bowl of a food processor. Process mixture for one minute. With motor still running, slowly add olive oil. Continue processing until smooth, periodically scraping the sides of the bowl. 2. Transfer 1/3 cup of the pesto to a small bowl for brushing onto the kabobs before grllling. Pour remaining pesto into another bowl and add water. This portion will be for brushing onto cooked kabobs. Set both bowls aside. 1. Soak eight wooden skewers in water for 30 minutes. 2. Cut zucchini lengthwise and slice each half into 12 half circles. 3. Cut bell pepper into 24 pieces. 4. Cut the white and light green part of each scallion into two pieces. 5. Thread shrimp, tomatoes, zucchini, bell pepper, and scallions onto skewers. Brush each kabob with olive oil, pesto, and sprinkle with salt and pepper. 6. Heat grill to 450 to 550 degrees. 7. Grill kabobs for two to three minutes on each side or until shrimp are opaque. Do not overcook. 8. 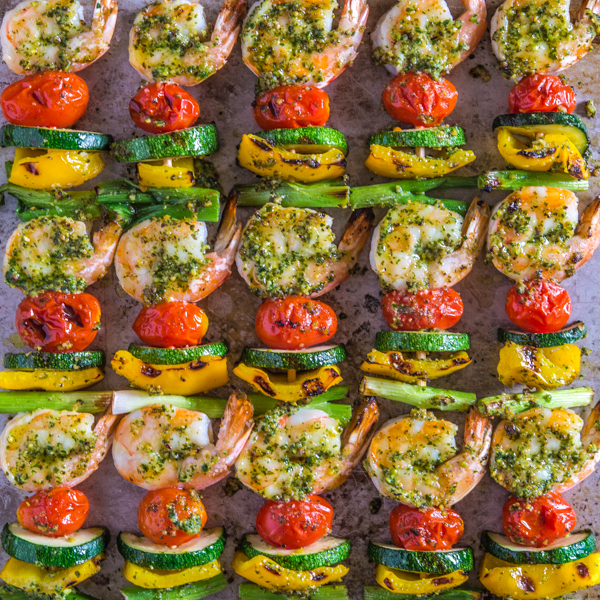 Remove from grill and drizzle kabobs with additional pesto and top with lemon juice. Serve immediately. These are honestly the best looking shrimp kabobs I’ve ever seen. I am now DYING to try them! Those seriously look unbelievable!!!! I need these in my life. They look amazing! I want these for dinner tonight. Once you really get into it, blogging really does take a lot of time! I figure each post takes about a day, although part of the time includes reading other blogs and such – something I’d be doing anyway. Anyway, I love grilled shrimp, and yours looks particularly good. Nice combo of flavors! Thanks so much. You have a unique approach to your pictures and it shows all the work you put into it. Such a simple and elegant meal pictured so beautifully Bill. Love this combination of shrimp and tarragon. I had forgotten how well tarragon compliments seafood. This recipe reminds me of the “Tuna Tarragon” a restaurant I worked at during my college years, used to serve! It was a fav and we always ran out! And your blog sure is a reflection of all the hard work you put into it! Lovely photos and great posts! What a great summer dish! Blogging does require a lot of time and I’m glad great dishes like this don’t! Your Tomato Pie is out of this world! Thank you for sharing!